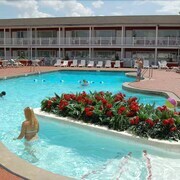 Situated in Lake George, this hotel is 0.3 mi (0.4 km) from Shepard's Beach Park. The modern, sleekness of the hotel rooms and the continental breakfast were the best part. 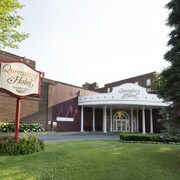 Which hotels are closest to the Lake George airport? 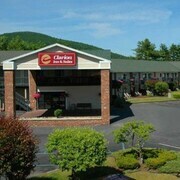 Where to stay near top Lake George attractions? 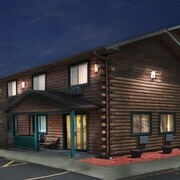 What kind of hotels are in Lake George? 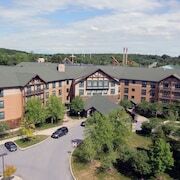 Which hotel chains are in Lake George? Nature enthusiasts will enjoy exploring Lake George, and visitors give high marks for the lakeside setting, magnificent mountain views, and theme park. Quaint and scenic, this city also attracts tourists with its golf courses. Top sights in the city include Fort William Henry, Lake George Dog Beach, and Prospect Mountain. Attractions like Water Slide World, Goony Golf, and Magic Forest Park are fun for kids of all ages. Notable city landmarks like Fort William Henry and Fort Ticonderoga might be worth a visit. The lakeside and mountain views highlight the city's natural beauty with places to visit including Lake George Dog Beach, Prospect Mountain, and Shepard's Beach Park. The Bell House Inn - With a stay at this 3-star bed & breakfast, guests can enjoy access to free breakfast and free parking, along with free WiFi. 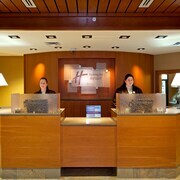 It's a favorite with Expedia travelers for its breakfast and comfortable rooms. The Inn at Erlowest - Our customers like the helpful staff at this inn. This 3.5-star inn features a private beach, free breakfast, and a restaurant. 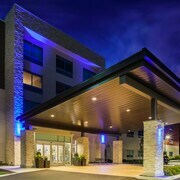 Holiday Inn Express Queensbury - Lake George Area - With a stay at this 2.5-star hotel, guests can enjoy access to free breakfast and an indoor pool, along with free WiFi. Expedia customers like its breakfast and pool. Other top sights in Lake George include Charles R. Wood Theater. In the surrounding area, popular places to visit include Congress Park, located 24.2 mi (39 from the heart of the city, and Saratoga Spa State Park, which is 26.2 mi (42.2 away. With so many choices for transportation, exploring Lake George is simple. If you want to see more of the area, hop aboard a train from Fort Edward-Glens Falls Station, Whitehall Station, or Ticonderoga Station. You can learn about water travel options at the marina. 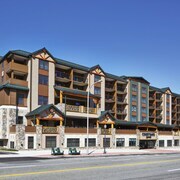 Lake George Village is a family-friendly neighbourhood that's popular for its restaurants. The neighbourhood's friendly people, small-town vibe, and natural features are just some of its charming qualities. Outdoor settings, such as the mountains, beaches, and lake, attract many visitors. 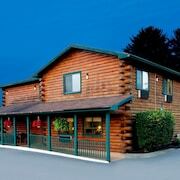 A stay at one of Lake George Village's hotels makes it easy to venture out into the greater Cleverdale area. At Zanadu's Museum of Curiosities, House of Frankenstein Wax Museum, and Patriot of Lake George Museum, you'll learn about local culture. A notable local landmark is Fort William Henry. Bring the family to Water Slide World, Goony Golf, and Magic Forest Park. Popular things to do in the area include shopping and boating. Lake George Forum and Adirondack Sports Complex are great places to catch a game or event. Dip your toes in the water and soak up the sun at Shepard's Beach Park, Lake George Beach, and Million Dollar Beach. Lake George Battlefield Park, Prospect Mountain, or Hearthstone Point Campground are ideal spots to enjoy the outdoors. Plan to do some shopping while in town? 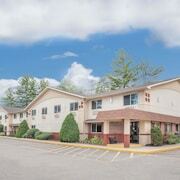 Consider Lake George Plaza Outlet Center, Log Jam Outlet Center, and French Mountain Commons. Adirondack Winery, Lake George Shoreline Cruises, and Lake George Steamboat Company are other spots for some local fun. One of the most popular attractions in the area is the Charles R. Wood Theater. You can also visit Top of the World Golf Course, Magic Forest Family Fun Park, and Wild West Ranch and Western Town. You can inquire about options for water travel at the marina. Lake George Village is 76.6 km (47.6 miles) from the airport in Albany, NY (ALB-Albany Intl.). 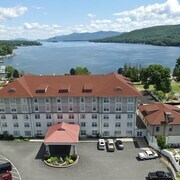 What are the most popular hotels in Lake George? 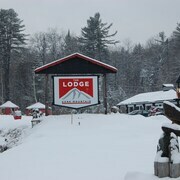 Are there hotels in cities near Lake George? 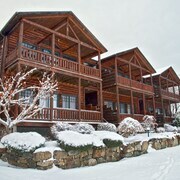 Explore Lake George with Expedia.com.au’s Travel Guides to find the best flights, cars, holiday packages and more!